After the field survey carried out in July 2017 part of the team was trained on the identification and classification of the ceramic material picked up and bagged at each collection/sample spot in the field. During the cataloguing of the pottery the then created database of surface material has been converted into an Excel spreadsheet with the different classes and types of ceramics associated with the spot where they were collected in the field. Having already imported the GPS points, of all the collection spots, into GIS, we discussed the best way of linking the excel table to the survey points in QGIS. The information that we want to display across the surveyed area regard the different types and sub-types of material and their chronologies (where determined). As for each collection spot (represented by a GPS point) there are more than one potsherd, the best way to link the GPS points and the table of pottery types is through a relation one-to-many (parent-child) so that every potsherd catalogued per collection spot is represented and searchable (Fig. 1). In this way, the two tables are linked and each type or class of pottery is searchable and displayable on the map across the surveyed area. Fig. 1 . Attribute table showing an example of one-to-many relation between the GPS point and the table containing the pottery classification. With the data stored in this way it is now possible to search for a specific category, class or type of material (from the table containing the pottery classification) and then display the quantities of the specific queried class of objects across the surveyed area (Fig. 2). These methods can be used by the heritage specialists such as staff members of DoA and INP to produce maps showing the location and quantities of specific class of objects, collected during the systematic field survey, across the site. 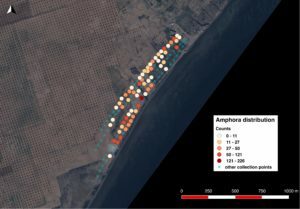 In Fig.2 the colour gradient represents the quantity of amphora sherds per each collection point, thus showing how in the southern part of the site there is a remarkably higher density of amphora. This could suggest, for instance, that in that area we have a higher density of material associated with storage and transportation, which provides hints on the function of that part of the site. If this information is then linked with the chronologies of the surface material (see below), then it is possible to have a clearer estimation of when the southern part of the site was used as a storage and possibly commercial purposes. Fig. 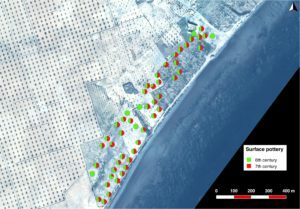 2 An example of quantity distribution of amphoras across the surveyed area on the site of Iunca. Subsequently, we introduced a new way of representing and storing the chronologies of potsherds (where determined) into the attribute table of the GPS survey points. We used an established method where time blocks of 50 years are used to store the information regarding the chronologies, as shown in Fig. 3. For each collection spot, some potsherds have been dated with different chronological resolutions (from 2 or more centuries to 25-year accuracy). Therefore, in order to overcome the discrepancy between diverse chronological accuracies, the time blocks method has been discussed with and proposed to the trainees as a way to record the chronologies of the field survey data. For each potsherd that has been dated we counted 1 quantity in each half-century (50 yrs) field – so that if a sherd was dated 400-700 AD, a unit is counted for each half-century from 400-450 to 650-700. In this way, it is easier to display how much each half-century is represented in each collection spot (Fig. 3). Successively, a selection of the half-centuries that someone wants to aggregate into a single layer is possible by simply selecting all the half-century with value greater than 0 and then export the selection as a separate shapefile. In Fig. 4 is shown how it is possible then to display the collection points where the field survey yielded material datable to the 6thand 7thcentury AD. Fig. 3 Attribute table of the GPS points showing the time-blocks used to record the chronologies of the pottery. Fig. 4 Example of how to display different chronologies across the surveyed area. Day 6 was dedicated to the creation of map layouts from GIS, which allows the trainees to produce outputs that they can use for communicate and disseminate their work (Fig. 5). This entailed the use of north arrow, scale bar and legend. As some of the trainees were already experienced with the use of the Print Composer tool of QGIS, they took the lead and taught the other participants how to use this tool, under our supervision. One of the main aims of the overarching Training in Action project is to form a number of people that can then train others after the end of the project, and therefore it is important that trainees develop teaching skills as well, starting from what they are more familiar with. Fig. 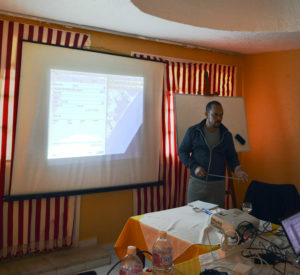 5 One of our trainees Mahmoud Hadia (DoA – Libya) teaching GIS. Lastly, in the afternoon of day 6 we discussed how to generate new layers in GIS and how to digitize shapefile and create attribute table, in order to store the information collected from other sources than field survey. The underpinning idea to convey is that trainees can use GIS for a number of different purposes as it is a suitable spatial database where to organise and compare different sets of data. The whole rationale of the advance training was to integrate the three main strands of teaching (survey/GIS, photogrammetry and condition assessment/management) and show the trainees how they could use survey, GIS and photogrammetry as documentation tools for the assessment of conditions, risks and resources of heritage sites in order to plan bespoke management actions. The tools provided in the first 3 days of advanced training were then recalled during week 2 when advanced photogrammetry and condition assessment have been discussed.